4 stars for a very amusing journey of self discovery. 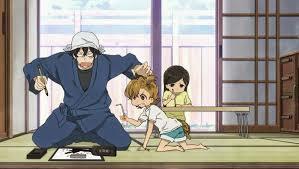 Barakamon is based on the manga series written and illustrated by Satsuki Yoshino. It was adapted to anime by Kinema Citrus and directed by Masaki Tachibana. Seishu Handa (Robert McCollum – Snow White with the Red Hair, Psycho-Pass) is a talented and well regarded Calligrapher, who has won numerous competitions despite his young age. His life takes a turn for the worse at a competition when he sees red at criticisms made by one of the judges, an elderly gentleman, who tells him that his work is uninspired and unoriginal. 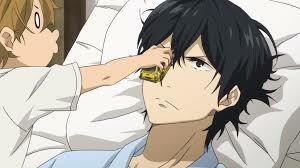 He loses his temper, punches him and hits him with his shoe. Disgusted with his behaviour, his father insists that he move somewhere quiet to rethink his attitude and also to gain some inspiration to take his work in a new direction. He heads off to live on the remote Gotō islands, off the coast of Kyūshū. Right from the start it is apparent that this may not be the quiet getaway he expected. His new home, which should have been empty, is clearly being used as a secret hideout for local kids and when he opens the cupboard under the sink it contains a small child, Naru (Alison Viktorin – A Certain Scientific Railgun, Eureka Seven: AO) who is obviously very at home there. 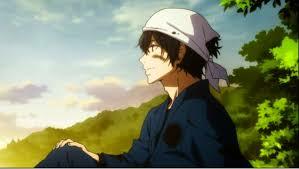 After repeated attempts to evict both her and the village leader, Yujiro (R Bruce Elliott – Rage of Bahamut: Genesis, Guilty Crown), he heads out for a walk and to explore the beautiful surroundings.Upon his return he is surprised to find that the whole town has turned out to help him unpack, and the village leader’s wife has cooked for him. This is his first taste of the community which will gradually change his way of thinking and maybe eventually even help him with his work. 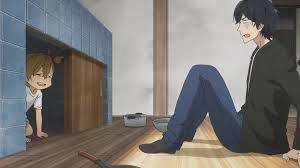 He must learn to deal with the local children and much to the surprise of his agent and best friend Kawafuji (Duncan Brannan – Dragon Ball Kai, Fullmetal Alchemist) he will also learn to care for other people as well as himself. 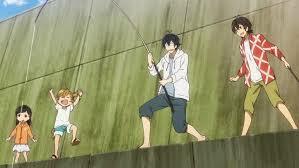 Barakamon is very enjoyable to watch. The island is beautiful and the scenery alone makes this series incredibly relaxing to watch. The music is lovely too, setting the scenes well. It is a truly heartwarming story, with plenty of comedy moments and one liners. Hando is a young man trying to discover what drives him by taking himself out of his life completely. A brilliant series and well worth adding to your collection. 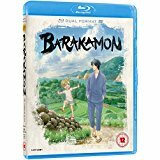 Barakamon is available to buy now on Dual Format DVD and Blu-ray.